BACK ROW: C. William Rockwell, Jeff Kleha, Cindy Gibson, Rick Bolin. FRONT ROW: Vice President Mike Thoroughman, President Rodney Barnett, Recording Secretary Michael Arnett. 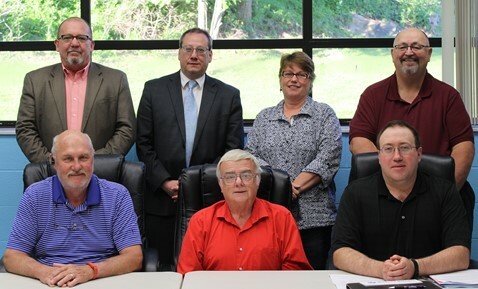 The Scioto County Board of DD meets on the third Thursday of each month beginning at 4:45 p.m. in the STAR, Inc. building. STAR, Inc. is located at 2625 Gallia Street in Portsmouth, Ohio. All meetings of the Board are open to the public. For more information, contact the Superintendent's Office by calling 740-353-0636 or send an email to: cwhite@sciotodd.org.